:When Molar Alan and his older brother, Aaron, fill out their Christmas wish lists front and back, the Santa at the mall informs the boys they won't be getting anything they asked for. Instead, he says, they will receive everything they never wanted. This isn't your garden-variety Santa, he's Dr. Chris Ringle, a pediatric oncologist, and he enlists the brothers as Santa's elves at the children's ward for the holidays. Molar's task is considerably harder, as he attempts to help a lonely little girl named Katrina. Katrina's surgery has left her scarred, and she has shut herself away from everyone. But it is through her that the true spirit of Christmas will touch the lives of all those around her in a way none of them would have foreseen. 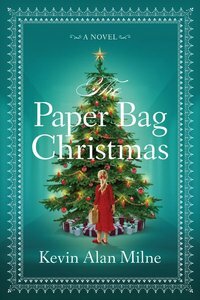 About "The Paper Bag Christmas"
Kevin Alan Milne earned an MBA at Pennsylvania State University. Born in Portland, Oregon, Milne grew up in the nearby quiet country town of Sherwood, Oregon, where he currently resides with his wife and five children. This is his first novel.